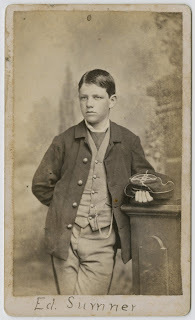 The Kentucky Military Institute cadet photographs (dated 1881; 0.02 cubic feet; 13 items) are now on ExploreUK. This collection includes 13 carte-de-viste of various cadets who attended the Kentucky Military Institute. The images are all dated 1881 May 27. The Kentucky Military Institute (KMI) was founded in 1845 by Colonel Robert Thomas Pitcairn Allen and chartered in 1847 as a military preparatory school. 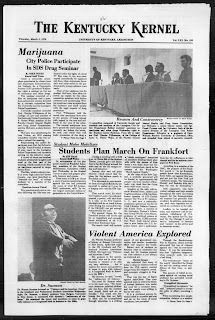 It operated locations in Lyndon, Kentucky, and Venice, Florida, where all the students were classified as cadets. Due to high tuition and waning interest in military schools, KMI closed in 1971 and eventually merged the Kentucky Country Day School in 1971. A batch of Kentucky county court records dating from the late 18th and early 19th centuries have been digitized for access on ExploreUK. These records (0.1 cubic feet; 1 folder) consist of three complaints filed in the Hardin Circuit Court. One complaint was filed by William P. Duvall, a legislator and governor of Florida, as the attorney for Thomas Helm who was trying to collect money owed to him. F. Grundy lodged the other two complaints; one concerns an assault and battery and the other an unpaid debt. These records (0.15 cubic feet; 2 items) contain information about the court and its proceedings during a period from September 1785 to May 1799.The first item is an execution book containing entries for cases that the court heard. The second item is a record book of court transactions from September 1787 to May 1799. This record book begins with an index of cases (at the beginning of the volume). The index is followed by a section regarding the rules of court. These records (0.1 cubic feet; 72 items) consists of legal documents issued by the Kentucky Circuit Court in Jessamine County from 1800 to 1823. Many of the documents were signed by Samuel H. Woodson, who served as court clerk from 1798, when Jessamine County was formed, to 1819. 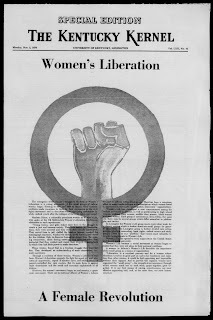 The papers include summonses, records of settlements of estates, and records relating to the execution of court decisions, such as the collection of debts. 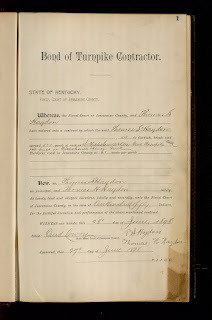 This book (0.13 cubic feet; 1 item) is a bound book of Bonds of Turnpike Contractors that records the bonds issued by Jessamine County to various businessmen for the laying of rock for roadways. The records date from June 27, 1898 to June 24, 1916. These records (0.1 cubic feet; 73 items) records contain miscellaneous depositions, bonds, summons, and other legal papers issued in Muhlenberg County, Ky. Many of the documents bear the signature of Charles F. Wing, clerk of the county circuit court from 1798 to 1856. Also included is a listing of the accounts of John Randolph as handled by John Clay (1803-1805). 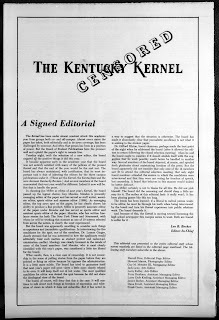 Kentucky Kernel issues dating from 1961-1970 were recently added to ExploreUK. The Kernels’ two precursor titles The State College Cadet (1891-1895) and The Idea (1909-1915) were also added.